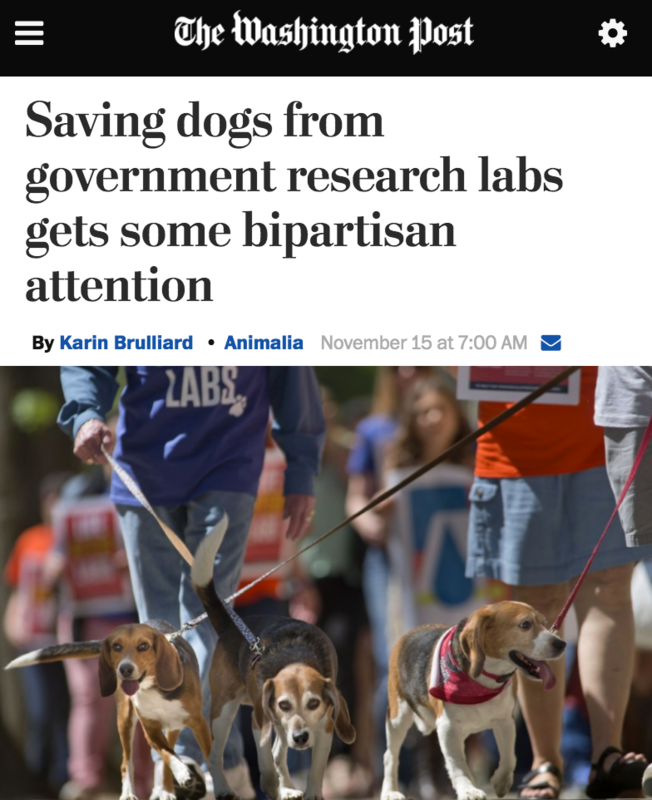 This morning, the Washington Post broke the news about the release of the White Coat Waste Project’s (WCW) Spending to Death investigative report (<–full report at link) and the launch of our new campaign to expose and end taxpayer-funded experiments on dogs inside of government laboratories. Our new report exposes how government laboratories are conducting wasteful, bizarre and deadly experiments on dogs with little or no transparency about what is being done and what it costs taxpayers. 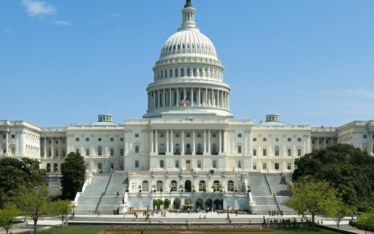 WCW will present the report to Congress at a briefing this afternoon with honorary co-hosts Rep. Dina Titus (D-NV) and Rep. Ken Calvert (R-CA). Federal records reviewed by WCW show that in 2015, more than 1,100 beagles, hounds, and mixed-breed dogs—even puppies—were subjected to experiments in government laboratories operated by the Department of Veterans Affairs (VA), Department of Defense (DOD), Food and Drug Administration (FDA), National Institutes of Health (NIH) and the Centers for Disease Control and Prevention (CDC). Hundreds of the dogs were subjected to experiments involving significant pain and distress. WCW’s review also found that four of the five federal agencies using dogs in experiments—the VA, DOD, FDA and CDC—do not publish any information about how much they spend on dog experiments, or how and why dogs are used. 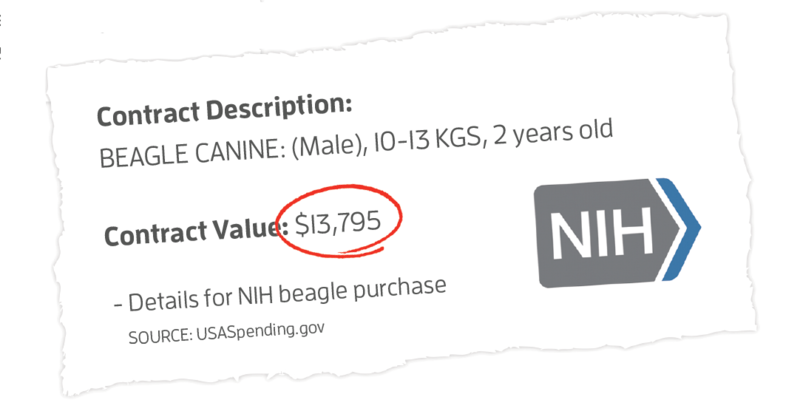 NIH publishes this information, and for one of the few projects for which data is available it spent $5.95 million since 2011 to give dogs heart attacks. Other recent experiments include exposing dogs to anthrax, repeatedly forced dogs vomit, and drilled into dogs’ skulls and damaging their brains. 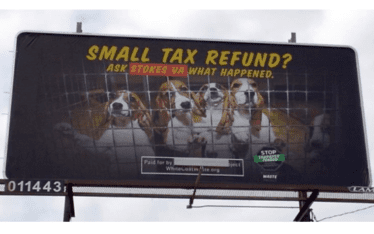 New polls show that 59% of Americans want to cut taxpayer funding for experiments on dogs, 75% of people want them phased-out altogether and 66% want spending information on all taxpayer-funded animal experiments to be publicly-available. 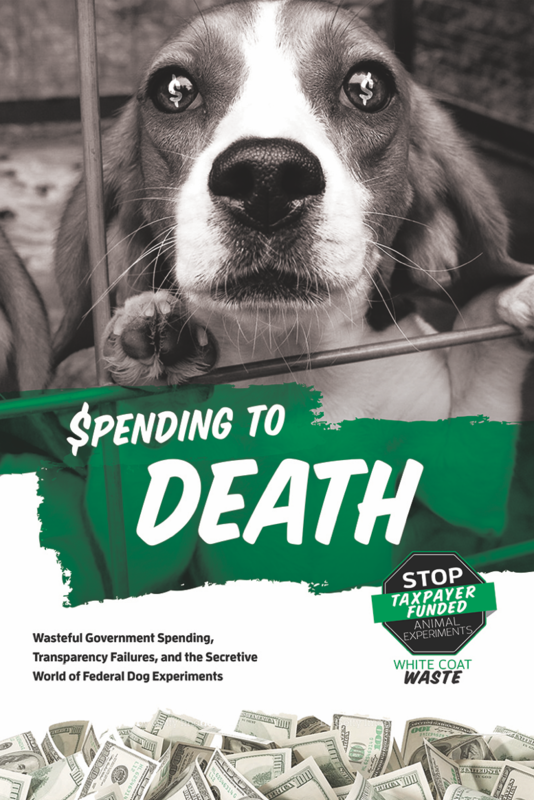 WCW is calling for an independent audit of federal dog experiments, public access to all spending and project details, and closure of all loopholes that allow unnecessary tax-payer funded experiments on dogs to continue. You can support our work to protect dogs and end government secrecy and waste by writing your Members of Congress to request that they investigate and defund dog experiments. Click the button below to send a letter now. I want this action stopped entirely. It is not necessary and inhumane. I certainly to don’t work to have my money go to this inhumane action. Please stop this horendous practice immediately! STOP THIS INHUMANE TORTURE NOW! Stop hurting these beautiful innocent animals. They don’t deserve this cruelty. Release dogs and stop abusing them! People go to jail for that! Please. You must stop testing on innocent dogs! It is barbaric and shows the evilness in mankind! Please stop the cruelty against animals now! I agree – I want this totally unnecessary, inhumane and barberic practice to stop. Any testing of any ANIMAL needs to stop all together. I can’t believe a person would even take part in this in humane acts of crudity. It’s horrible that our so-called “peaceful” country does this to poor, helpful animals. Shameful. Stope the needless torture of these poor animals which is primarily a ploy to receive government funding!! THESE HORRIFIC EXPERIMENTS MUST STOP!!! WHAT KIND OF PEOPLE ARE YOU TO THINK THAT THIS TYPE OF TREATMENT TO OTHER LIVING BEINGS IS OK????????? I totally Agree!! It is such a barbaric act We need to do other things besides torture and kill innocent loving animals Shame on the USA SHAME!!! I do not want my tax dollars used on animal experiments,they are not only cruel and consist of severe animal abuse but they are also not needed. Do NOT waste my tax money on the torture of these innocent souls! How are any of these tests ‘necessary’? The more ‘tests’ performed on living creatures that feel pain, the longer the ‘researchers’ can receive grants and live off of the taxpayer. Heartless. Stop. This needs to stop immediately!! These are sentient beings, they are not for experimentation!!! STOP THIS NOW!! This has got to stop. Unnecessary and cruel. Dogs. Cats. Monkeys. Rabbits. No more testing or torture of animals. Here we are using innocent animals for testing by the VA and we try to get the government to stop outside organizations from doing this, WOW! Horrific STOP this, PLEASE!! Unnecessary!!! As a retired nedical professional, I can state with absolute certainty, that many drugs tested on animals, have later been removed from the market due to unexpected, unforeseen adverse reactions, causing, sometimes death to humans. While I am not a research scientist, I still have basic knowledge about medications, precautions and adverse reactions. I also have knowledge about anatomy and physiology . That being said, the last time I looked in the mirror, the reflxion looking back was not a dog, cat, mouse, rabbit, monkey or a fish. My point is if I don’t look like them, then I am not them, inside or out. Yes Donna, THAT IS THE POINT of our effort here: to convince congress to cut off the funding for these revolting self proclaimed “researchers” who really are only one degree of separation from the torturers working for ISIS. Their chosen career provides a thrill for them. Consider that if you think you are superior inside and out when you look in a mirror. Indeed money does play a huge role, and our new administration claims to be searching for ways to trim its budget. What a great start: to cleanse ourselves of this aberrant sick behavior! This has to end NOW! STOP THIS HORRIFIC BARBARIC TESTING!!!!????? STOP THIS NOW!!!!!!!!!!!!!!! SAVE THIS INNOCENT ANIMALS!!!!!!!!!!! This barbaric use of animals for money must stop! I don’t know how people who do these acts of violence live with themselves! Stop this in humane and cruel treatment of animals! It is a crime! How can we follow up? Who are these criminals? How can it be stopped? Karma will find these barbaric people ! Outrageous this is going on. Stop this testing now!! This must stop!!! This is horrific and deplorable!!! End this horrific and wasteful of our tax dollar! Barbaric! Despicable! Wasteful of our tax dollars! This abuse is inexcusable & shameful. Plesse stop taking our tax dollars to fund torture. Mans Inhumanity to these innocent,voiceless animals needs to be stopped ! Just Pure Evil ? Stop this carp now. Sick people..evil..how could you do this to an animal? Is this where you want your hard earned dollars to go ?? I refese to have my tax money paid regularly and timely onto act such as the these!! This without question, horriffic acts of abuse, neglect and ultimately murder! Stop it now!! This is just the most disgusting inhumane thing I have ever heard of. It needs to stop immediately!!!! I don’t want any of my money to go to anything like this! Stop this barbaric practice! Animals have feelings and we are their voice. How could they??? This MUST STOP!!! If it’s inhumane and unethical to do to humans it’s inhumane and unethical to do to animals too!!!!! I do not want my taxpayer money spent on the worthless, senseless, barbaric torture of innocent dogs and puppies under the fraudulent guise of science research. STOP it now! Stop this useless and cruel testing on innocent animals. Don’t use my taxpayer money for your cruel and unnecessary torture. this is disgusting !!!! and I can’t believe our text dollars are used to her at these poor dogs this needs to stop immediately it’s horribly disgusting hurting and killing these poor dogs for stupid experiments, STOP !!!!!!!!!! Is there a petition against this? I hope this link works. All animal experiment must stop NOW! 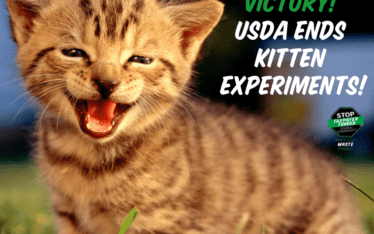 Why experiment on voiceless creatures? You already know those things have negative consequences, so why do worse than or equal to the Tuskegee experiment on these loving pets?!!!!!! I refused to work in a beagle lab years ago because I thought it was wrong… Ans they weren’t even doing worse than this! They were actually helping poor lil ones with backpain and i couldn’t do it. Anatomy is very different, healing is different. One minute of pain for us is 7 minutes for them!!!!! 1 yr is 7 yrs of torture for them!!!!!!!! Wasting money is one thing, sadistic torture, unethically, is vile, abominable, and punishable!!!! What else a wrong with America?! I am ashamed for all. Money talks till it personally affects you. STOP THIS NONSENSE NOW AND PUT IT IN CHILDREN’S PROGRAM, MUSIC PROGRAMS, ELDER PROGRAMS. STOP NOW!!!!!!! Please stop this unnecessary torture of lab animals. They is a shameful practice and should not be government funded. This is barbaric. The means FD oesnot justify the end. Intelligence without compassion is ignorance. Stop toruring animals. That is barbaric!!! They don’t need to test harmful anything on if any living being including animals !!! Stop this Inhumane treatment of God’s creatures. God is watching and so are we. Stop now. KARMA!!!! These barbaric people need to think about that. What ever your actions are, it will come back at you, these poor animals don’t deserve to live with this abuse, and we as tax payers should not be required to pay for this evil, torture. The bible says we as humans are to protect animals, they are gods creations, not torture them. Judgement day before God will not be pleasant. I pray God kicks everyone of you to hell so you can live with the torture you inflicted on these defenseless animals. This makes me sick to my stomach. How do you people look in the mirror without revulsion or sleep at night without nightmares. This serves no purpose except to fulfill your sadistic needs. Stop all the experiments! These dogs need to be saved and put into loving homes. This is entirely inhumane treatment of dogs or any animals for that Matter! Why is our tax dollars being spent without the consent of the American people. I think it’s time the American people have a say in ehat their money is spent on! This has never been necessary. It needs to stop. We need to be the voice for these helpless animals. Their lives matter and I don’t want my taxes to pay for such horrific testing. It’s heartless. THIS TESTING IS OF NO VALUE TO US…….JUST A WAY FOR SOME PEOPLE TO HAVE A CRUEL JOB. IT NEEDS TO STOP NOW. THIS TORTURE AND ABUSE OF POOR HELPLESS DOG IS HORRIBLE AND YOU ALL SHOULD SHOULD HAVE THE SAME DONE TO YOU!!!! This needs to stop immediately! It has no benefit to human life. It’s cruel & inhumane and has Nono relevance to humans.I don’t want to support this with my tax dollars. Please stop animal testing. It is cruel and barbaric. There are humane alternative test methods available. STOP USING MY TAX DOLLARS ON THIS BARBARISM!!!! This is so wrong to do this to these innocents, these babies who only want want to be part of a family & loved. They were not domesticated to be treated like this! End animal testing and abuse IMMEDIATELY! It is wrong and inhumane. Stop this cruel behavior now!! When are we going to realize we are in the 21st century and we do not need to use animals for this anymore? I do not want my tax dollars used for this nonsense!!!! Please stop this abuse on all dogs and all other animals. It’s all uncalled for and absolutely is not necessary.. The government needs this another labs shut down and stop this and quit using my tax dollars for this if you want to continue testing then use humans since you probably do any way, I know it is about the money you could care less about animals or people. as kong s it does not reach your door step. Put these savages out of business! How dare anyone do this to another life – helpless lives! Please stop this at once. Use death row inmates for these studies! NO ANIMAL should ever be subject to this kind of abuse. Surely you can find your answers without this inhumane act………. These barbaric experiments must stop immediately!!. No animal should be forced to endure such pain! STOP THIS ATROCITY AND BARBARISM AT ONCE!!!! PLEASE STOP THIS SENSELESS CRUELTY. Those that experiment on creature’s that can not defend themselve’s are not human in any way. Animal’s were not put on this earth for your entertainment of sickness. This has to stop! These animal’s are loving and loyal. My tax money was not to be used in this manner. Stop with the cruel and unnecessary experiments that don’t have a purpose for human life or any life for that matter. Do we live in a denial that this is barbaric or what ??? This needs to stop for all animals now !!! I have almost lost respect for the human race for the cruelty acts that most humans are capable of performing. Please help to change that. Stop testing on these animals. Let them be adopted out and end your studies for good. The FDA requires drug companies to ry their drugs in 2 different species as part of a New Drug Application. The beagle is the single best species – BUT only 50% at most reflect what is seen in humans. The number of animals can be reduced. The animals can be used ofr single experiments and then be provided for – without future experiments. The FDA needs to ensure drug copanies do the MINIMUM number of required tests. Many newer drugs work on the immunologic sustem – and NO animal species is appropriate. The FDA – and AL – agencies mucy be transparent about what they are doing, number of animals to be used and why. Needs at least annual review bu outside independent review group. This is disgusting! How could anyone torture a living being like this? This needs to stop and stop taking taxpayers money! I don’t want my money going to support this abuse! Forty years ago my husband was in Castle Point VA hospital and he said he listened to dogs scream all night long. I had hoped they had stopped using animals in research. Nothing has ever been cured through animal testing. This needs to stop. In no way is an animals DNA anything like a human. This is completely insane and utterly disgusting wrong and cruel torture. People, DO NOT allow the president to approve more monies for the military, they do not get it, they torture animals with it and it has to stop NOW. Sent letter–made it shorter and to the point. They will only win more votes if they GET RID of this experimenting. White Coat Waste Project is a 501(c)(3) bipartisan coalition of 400,000+ liberty-lovers and animal-lovers opposed to the government's wasteful spending on animal experiments. Our mission? To stop $15 billion in taxpayer-funded animal experiments. National Review calls it a "refreshing consensus-building argument." Our work has been profiled by Washington Post, Science, US News & World Report, FOX News, LA Times, TheBlaze, Associated Press and Daily Caller. Contributions are tax-deductible. © 2016 White Coat Waste Project. All Right Reserved. Produced by Lagos Consulting.